Our german shepherd just delivered 4 puppies! We're overjoyed this morning when we discovered that our german shephed we named Girlie, just delivered 4 beautiful puppies! They're so cute and are pure-breed german shepherds....Many people are asking if they are for sale, but as of now, we can't yet tell whether they are for sale or not. We are just simply amazed and awed at these new little creatures which are definitely our source of joy. It's truly a miracle of miracles! I wish I could post their pics here, but since I don't know how, I guess I'd just be contented with merely describing them. They're brown black, just like girlie, and they are all girls! They're so cute. I'm happy girlie is taking good care of them. She's constantly licking them dry, and now they're spending the rest of the minutes sucking milk from here. Yes, this is the first time I have witnessed a real dog delivering her puppies. They're our new addition to the family, and I am really overjoyed.....could not help but share my joy to everyone. That's really great news psyche49f! I love dogs. I have three right now and they are adorable! 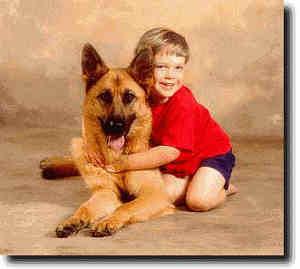 We had a german shepherd when I was younger. His name is Prince. I know how you feel about not selling your dogs. Sometimes, you just want the puppies to be there with you for as long as you can. I must admit that there were instances that I shed tears when I give away our puppies. I hope your four beautiful puppies will remain safe and healthy! I bet they are beaufitul! My husband wants a couple purebred german shepard puppies so don't tell him you have them! German shepards are beautiful dogs and they are usually really smart too. Awww, how cute psyche. Shame you can't upload a pic. Do you have a digital camera or scanner? Maybe I could give you some pointers on how to upload pics. When I was a kid we had one dog that had puppies, she was a scotch collie (lassie dog) and my mothers boyfriend's little runt of a dog got to her... LOL, we commented that she must have been VERY accomodating since he was about a quarter of her size. I can just imagine her laying down to let him get to her... little tart. Puppies were adorable though, especially the runt of the litter whom we affectionately named 'Tiny'. For the first week we constantly had to put him back in the box with his mother because she kept rejecting him... eventually she gave up and let him stay... funny thing was he ended up being the strongest of the bunch. wow! That is very cool psyche, Can I ask one? joke!LOL, I know the feeling and its' truly exciting especially when they start running and playing around the house...Soo cute!